No one can emphasize enough the importance of brain development in early childhood education. Today’s developing technology and research have allowed us to learn more about the brain, how it works and the critical periods for its development. The main environment for your baby at this age will be the bedroom. It is important to take note that the baby’s environment prior to the outside world was the womb. In the mother’s womb it was quiet, dark and sounds were sedated. This can be attempted to be replicated in the baby’s bedroom for the first 8 weeks to help the child adjust to the new world positively. Soft classical music can be played in the room as this can be soothing to the young baby. Have some natural lighting and if possible have a window where a child may watch the wind blowing through leaves or trees. Baby this young will be mostly attracted to mobiles with great color contrast, such as black and white. One can even simply attract a child’s attention, eye tracking, by making shadows by having the light source behind a parent’s hands. At 1 month your baby knows to cry for food and expects to be fed regularly. By 4 months your baby can recognize you in a group of people. The hypothalamus controls your baby's deep sleep—the non-dreaming shut-eye that helps your baby's brain recharge after a hectic day of exploration and development. During deep sleep, the brain is at rest though your baby's body can continue to move. Here is the nice web-site to find out more information about this. At this stage children are moving about more and have developed strength in the neck, arms, hands and legs. Hopefully in the early months your child has had opportunities to move freely. This can be further implemented at this stage of your child’s development. Your baby's stronger neck and arm muscles allow him to practice rolling over toward one side, a milestone that will probably awe and amuse you. A child generally slithers and pulls up on average about 8 months. If it is later do not be worried, each child has their own blueprint of development. If children though are given the opportunity to freely move then they will never cease to amaze us with their abilities. With the movement mat one can place a mirror in which the child can watch themselves and see their own reflection to learn more about their bodies and movement. When a child learns to create movement in their environment they will feel that they have control which in turn can later develop into a strong self-esteem. Children in the period 6-18 months are particularly sensitive to caretaker and that this is the time when they must develop their core attachment to their parents. The language at this stage is that children are starting to talk back, and experiment with their vocalization from the sound that they hear. It is important then to communicate with the children. The dance of communication can be that the adult talks silence then the child talks. This is to model to them how communication happens. The adult may imitate what the child has said or say something else. When talking to your child there is also no need to talk in a high pitch voice talk to him/her like you would another person, in a clear well-articulated manner. 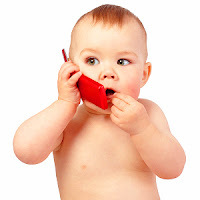 There is no need for baby talk for the child to learn real language. They will learn language from how we speak to them, so speak to them the properly. Talk to them about how things are around you; describe what they are seeing, and not just instructions of what you want them to do. When reading a book, point to objects one a time and name it. This will teach children that each thing has a name and they can learn that if repeated to them constantly. By 7 months he can remember that a jack-in-the-box pops up when the music ends. The article written by Kathy Sylva about Critical periods in childhood learning. The time between one and two is one of rapid change. Your baby is on the move and discovering the world. Parenting becomes demanding in a different way because you have to think about safety and setting limits, as well as caring for your baby. Some parents miss their tiny baby and others are pleased that their baby has a little more independence. Children at the end of this stage are more mobile and are able to walk with stability. If the children are given the freedom to move when they were younger their gross motor development will flourish. Children now will be able to do more things with their hands as they are now free from crawling. At this stage children are learning to communicate. They may say their first intentional word at 12 months. 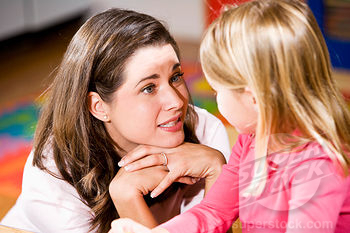 You need to encourage this development by constantly talking TO the child not AT the child. You do not just talk to them to tell them what to do but also to tell them about the things around them and how things are going. 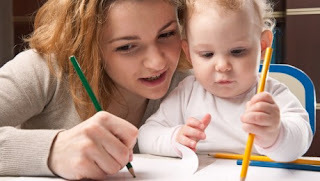 At 12-30 months language abilities develop very rapidly. Between 18 months and 2 years of age her ability to recognize similarities and differences in things increases and she will be interested in sorting things into groups, e.g. cars, blocks, animals. By 15 months your child is able to walk alone with feet wide apart and arms held high to maintain balance. At 15 months he gets to his feet using his hands to push up with and by 2 years can get up without using his hands. By 2 years most children can go down stairs while holding on but will put two feet on each step before moving to the next one. One year old can push themselves along "scooting along" on a four wheeled riding toy. By two your child will be interested in and capable of turning knobs and pushing buttons. And what about language development? Your child's speech increases from an average of 10 words at 15 months to as many as 100 or more between 18 months and 2 years. Their understanding of words is even greater. By 2 years your child can tell you most of what she wants with words eg "outside", "milk", "biscuit", even though many words will not always be pronounced correctly. By 2 years sentences become longer and more accurate eg from "more" to "want more" and then "I want more". Your child's language understanding is also improving so she can remember two things at a time eg "Get the ball and bring it to Daddy". Besides words to say what they want, children at this age have begun to learn some words to say how they feel, eg feelings of happiness "goo" or hurting themselves "ow", "sore" or a word for wanting a band-aid. By two years your child will have enough language skills to be able to tell people what she wants them to do eg "no" or "go away". 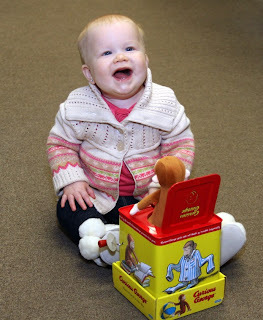 Your baby may stammer or hesitate over particular words or when excited. she does not understand simple directions (this does not mean she will always do as you tell her). she often runs very far away [out of sight] or climbs extremely high without hesitation. showing distress when left by a parent and often clingy when the parent returns. does not show separation anxiety. playing near other children, but not yet with other children (unless the other child is older and able to adapt her play to fit the 2 year old). dependent on a comforter such as a dummy. does not show awareness of different people. able to pick up small objects. able to walk backwards pulling a toy or trolley. not walking steadily, especially if the child has a limp. using 6 or more recognizable words (the words may be quite unclear, but the primary caregiver is able to tell what is meant by the sound). does not listen when others are talking to him. starting to put 2 words together such as "daddy's car"
babbling while playing, with a few recognizable words in the babble. uses signs, grunts or gestures only when she wants something. 2 Thanks to this web site, it helped me a lot in my project. Three year old do not tell 'lies' as such but sometimes the inside and outside reality gets mixed up. The baby will love to talk to you about these important things. Never laugh at their confusions, and give them small amounts of simple information when explaining things. 3 year old often enjoy being with other children and they now begin to play together more. They are learning that other people are real and have feelings. This means they can be upset when other people are upset. Taking turns is a skill that they will learn as they approach four, but if they are upset or worried they will not be able to share their own special things. They are starting to be able to wait a short time for what they want, such as 'we will go out after you eat your lunch'. 3 year old are less likely than 2 year old to have kicking and screaming tantrums. They are eager to please you. With your help they might be able to try something else or wait for a few minutes. 3 year old are developing a sense of humor and like to laugh at and repeat silly words and situations. They will like to have choices but they usually can cope best if the choice is limited such as "you can wear your red shoes or your blue ones". They may still need a dummy, blanket or other comforter when tired or away from home. They can have very stereotyped ideas of what 'boys' and 'girls' are like, eg girls wear pretty dresses and boys are like Superman. They are starting to take responsibility for their own toileting. They may have accidents (wet pants) during the day and be wet at night. 3 year old get across what they want to say in most situations. Some 3 year old speak very clearly, while others still use some 'baby talk'. Some may stumble over some words but this will probably clear up by itself within the year. The average 3 ½ year old knows more than 1200 words. 3 year old can usually understand "place" words such as - under, on, beside, back, over. 3 year old ask questions beginning with "What" "Who" "Where" and "Why"? They can talk about what happened yesterday and about tomorrow. If you can't understand what they say most of the time. If they are not using sentences of three or more words. If they are not interested in using the toilet or they are frightened of using the toilet. If they have big fears that go on for a long time. If they can't jump with two feet in place. If they don't seem to understand what you say to them.